The Arcata Community Garden has an abundance of comfrey in the garden. They would like to encourage anyone who may be able to use it to come and harvest some. The garden is located at on the corner of F and 11th Streets in Arcata. There are also regular community volunteer workdays on Wednesdays from 11 a.m. to 2 p.m. For more information contact garden@opendoorhealth.com or (707) 269-7073 ext 3179. Teachers, students and parents from Laurel Tree Charter School in Arcata are now partnering with Villa de Valle Community Garden to implement a fabulous new curriculum from the Edible Schoolyard Project. All primary students and middle school students will be using this curriculum to bring Social Studies, Science, Math and English lessons to the garden and the kitchen, four days a week! For more information on the Edible Schoolyard Project visit edibleschoolyard.org. The City of Arcata's Bayside Park Farm Summer Internship Program is for those who wish to be involved in the seasonal rhythms of small-scale organic farming. Interns make a 3-month commitment to working 6-hours a week in exchange for fresh veggies and hands-on training in organic agriculture. They are looking for reliable, responsible, and hard working individuals. For more information stop by the farm or call (707) 822-7091. Food for People offers free farmers' market-style produce distribution at several locations throughout the County during the growing season through October. Bring your own bag and see below for details. Every third Thursday from noon to 2 p.m. at 307 W. 14th street. Every third Wednesday from 11:30 a.m. to 1:30 p.m. at 2331 Rohnerville road. Every Second Tuesday from 10:30 a.m. to noon at 437 Maple lane. Every second Tuesday from 12:30 to 1:30 p.m. at 553 Redway Drive. Many communities feature a local farmers' market that runs into the Fall season. Many of these markets accept CalFresh, formerly food stamps, which can purchase seeds and starts in addition to healthy foods. Some markets even have a "Market Match" program where bonus dollars are provided for using CalFresh at the Market. This Match program has been extended this year to SSI recipients who are unable, in the state of California, to receive CalFresh. Growing fresh foods with CalFresh maximizes both the economic and health benefits of the program - seeds cost pennies and can grow an abundance of food, and gardening provides physical activity and other physical and mental health benefits. North Coast Growers Association coordinates some of the markets below and has more information about local farmers' markets and the Market Match program on their website, www.humfarm.org. Every Thursday from 3:30 to 6:30 p.m. at the new Eureka Natural Foods in McKinleyville (2165 Central Avenue). Every Saturday from 9 a.m. to 2 p.m. at 8th and G street in Arcata. Every Tuesday from 3:30 to 6:30 p.m. at 747 13th street in Arcata. Every Tuesday from 10 a.m. to 1 p.m. at F and 3rd streets in Eureka. Every Thursday from 10 a.m. to 1 p.m. at F and Henderson streets in Eureka. Every Tuesday from 3 to 6 p.m. at 10th and L street. Every Tuesday from 2 to 5 p.m. at 6743 Avenue of the Giants. Every Tuesday from 11 a.m. to 3 p.m. at Machi Road, near the marina. Every Friday from 11 a.m. to 3 p.m. at Locust and Church streets. 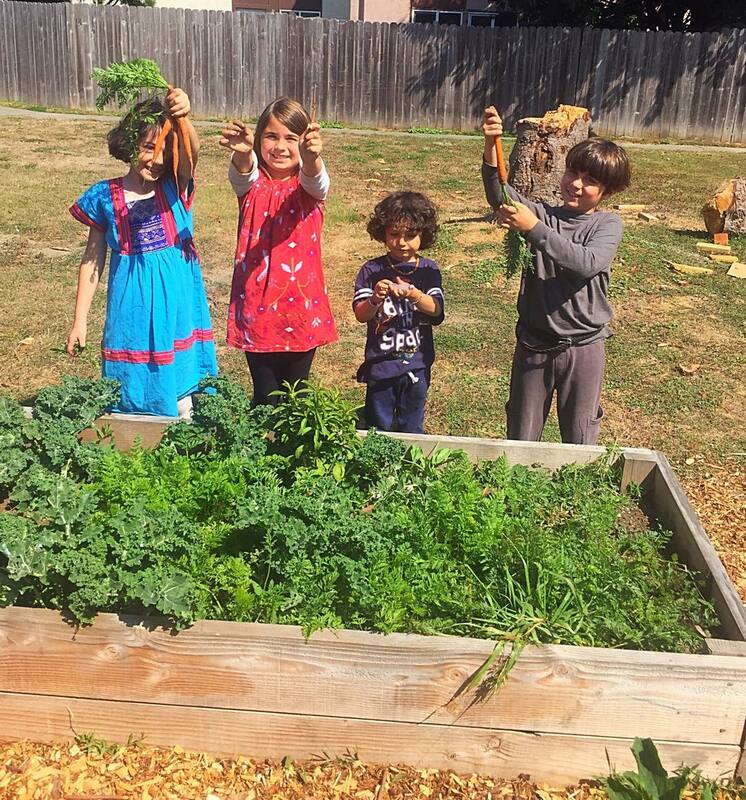 Kids harvest carrots at the Villa de Valle Community Garden. - Cooper Gulch Play and Plan: Saturday, October 1 from 9 a.m. to 4:30 p.m. at Cooper Gulch Park, 1720 10th street in Eureka. A diversity of activities centered on creating a sense of possibility in the Park. Results of community survey will be shared and the next steps in figuring out what would make Cooper Gulch Park more meaningful and welcoming to the community as a whole. This could include gardens and edible landscaping. For more information visit coopergulch.org. - Save the Planet with Pulses: Saturday, October 1 from 10 a.m. to 1 p.m. at the Arcata Plaza Farmer's Market. Learn how local beans and other pulses can provide high protein meals without much CO2 emission. Play our bean bag game and taste samples of food made with pulses. What is a pulse? Come find out! For more information visit locally-delicious.org or call (707) 633-5467. - Kids' Salsa Competition: Saturday, October 1 from 10:15 a.m. to 1:45 p.m. at Strong's Creek Plaza, 1095 South Fortuna Blvd. in Fortuna. Students throughout Humboldt County are teaming up with some of the finest local chefs to create unique, mouth-watering salsas using local ingredients. Eight teams will convene on Strong's Plaza for the first ever Fortuna event during the Apple Harvest Festival. The public is invited to taste the salsas from 11:30 to 12:30. For more information visit localfoodmonth.org. - Bayside Gardens Pumpkin Patch: Saturdays and Sunday starting October 1 from Noon to 6 p.m. at Bayside Gardens, 2074 Old Arcata Road. Nice mix of sizes and varieties. Feed the cows, ride the tractor, swap squash recipes. Free Admission. For more information contact jbittner@suddenlink.net or call (707) 496-0618. - Canning Workshop: Sunday, October 2 from 1 to 5 p.m. at the Ag Center on Humboldt Hill. Come join in the fun of learning how to can! This workshop is geared toward beginners, but all levels of expertise are welcome. For more information contact ddgiraud@ucanr.edu. - Herb Walk: Saturday, October 2 from 1 to 3:30 p.m. at Dandelion Herbal Center in Kneeland. Learn to identify wild and cultivated local medicinal plants and how to harvest, dry and store them for future use. Cost is $25. For more information visit dandelionherb.com. - Bee Friendly Garden Book Signing and Talk: Saturday, October 8 from Noon to 4:30 p.m. At Digging Dog Nursery, 31101 Middle Ridge Road in Albion (Mendocino). Join Kate Frey for a book signing and talk about designing a garden that nurtures bees and supports biodiversity. Kate is a world class garden designer and the author of the recently published The Bee Friendly Garden. At 2 p.m. join Deborah Whigham for a guided tour and discover plants that add late season pizzaz, spark winter intrigue, and provide welcome fodder for the birds, plus glean great design ideas and helpful maintenance tips! For more information contact Digging Dog Nursery at (707) 937-1130 or email business@diggingdog.com. - Binational Health Fair: Sunday, October 9 from noon to 4 p.m. at the Del Norte Community Health Center, 550 E. Washington Blvd. in Crescent City. Flu Shots, Well-Women Exams, Free coffee cards for women who their Pap Smears, Health insurance evaluations and information, free grocery gift card with evaluation, great food, music and entertainment, prize raffles, kids games and more! This is a smoke and soda free event. For more information call (707) 465-6925. - Kids' Salsa Competition: Saturday, October 15 from 10:30 a.m. to 1:45 p.m. at the Arcata Plaza Farmers Market. Students throughout Humboldt County are teaming up with some of the finest local chefs to create unique, mouth-watering salsas using local ingredients. The public is invited to taste the salsas from noon to 1 p.m. For more information visit localfoodmonth.org. 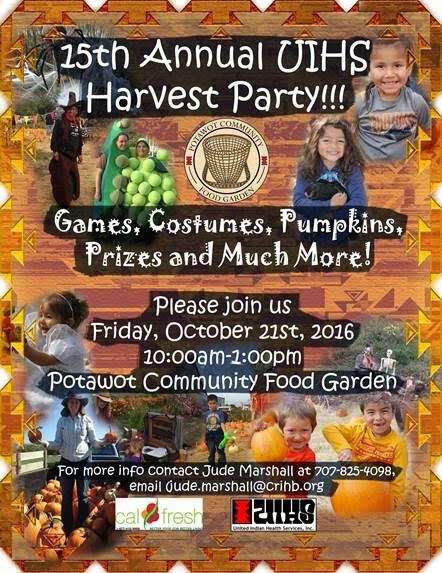 - 15th Annual UIHS Harvest Party: Friday, October 21 from 10 a.m. to 1 p.m. at the Potawot Community Food Garden of United Indian Health Services (UIHS). Enjoy games, costumes, pumpkins, prizes and much more! Volunteers are still needed. For more information contact Liz Lewis at 707-825-4064 or Jude Marshall at (707) 825-4098. - Healthy Lifestyles Fair: Sunday October 23 from 12 - 4 p.m. at the Fortuna River Lodge. The event is sponsored by Open Door Community Health Centers. For more information please contact (707) 826-8633 or check back at www.northcoastgardens.org.